I don't know, Mike. I'm not sold on the name "Huskies" anymore than I am "Raptors". Beside the history of the name (of a team that was only around for one season) Huskies is as irrelevant to Toronto as the Raptors name is. 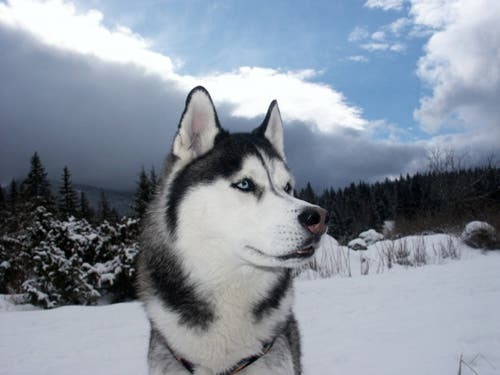 In fact, Huskies would only reinforce the stereotype of Canada being a frozen wasteland. I still say keep the Raptors name but change the reference to a bird of prey, rather than a dinosaur. Eagles and hawks, etc. are classified as Raptors. Also, change the colour scheme to include the now traditional Toronto blue and white. I'm hearing they want to brand as Canada's team. When the Raptors wore the Huskies uniforms on occasion, I always thought they looked fantastic. Simple and bold. I would love it if they went to that. If they're going to change the name it better be to "Huskies." Change the colours to blue and white and it would be perfect. The name "Raptors" has been wearing on me over the years, it's a silly name. If the franchise wants to get serious and start winning a new re-branding away from that silly name would be a good start. I'll throw my vote behind the huskies too, even though I'm not even a basketball fan. I haven't liked 'raptors' from the start. I don't care if they call the team the Toronto Ballickers......... Just get/KEEP some decent players and start to win some goddamn games. 18 years of suckage is enough! Perhaps a name change was always in the books. As I recall they really wanted to attract the younger crowd as it was believed that quite a lot of kids loved the game (i.e. bought the merchandise) and were the future of basketball in TO... therefore why not name the new team after a popular movie franchise that appealed mostly to kids...dinosaurs were cool and the colours vibrant what kid would not want to be a fan…Remember the Grizzlies in BC? How about the mighty Huskies? Toronto Highlanders, or Pipers, might be more popular for this week. Three things that have become irrelevant recently in Toronto.The Raptors,the soccer team (Hell I don't even remember their name) and The Toronto Star. Would be even cooler if, during games, instead of regular jerseys, the players wore those cheap grey sweatshirts with wolves on them that you see small-town redneck type folk wearing. Most people can't tell the difference between a wolf and a husky anyway. Of course, they'd be quite hot wearing sweatshirts during a basketball game, but it's a small price to pay to be a professional athlete. We could even shmear mustard and other stains on 'em like real rednecks. What is with wolves shirt? I see that at times. Don't really get. @CQ, aaah I see what you did there. 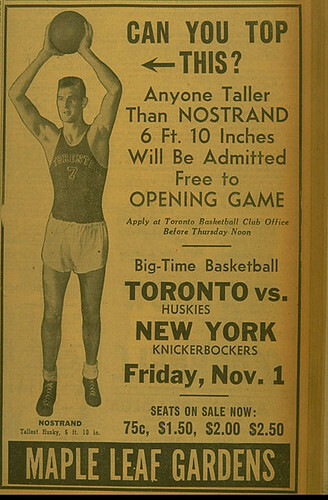 Being taller than 6 foot 10 back then with no skill you get a free ticket to watch a game in the 40s. With the Raptors you get to be a first overall pick. Thank you thank you, try the veal. Highlanders is already in use by a soccer club in the USL out of Victoria and a AAA hockey team. Might be tough to get the rights. Does ANYONE truly care? Someone already said it. Try getting some players and coaches that have a modicum of talent and could possibly win something. Somewhat more important than a marketing scheme ,no? And as a bonus would actually help the marketing. If MLSE do go for a name change, the Huskies is the last name in the universe they should choose. It is a mark of failure and racism. It is the name of a team from 67 years ago that has no real tradition but rather just one barely played season with a terrible losing record, plus, it was also a "whites only" team from before integration. It would just rebrand the team as suckier looking "junior Timberwolves" failures far worse than anything the Raptors name could portray. As well, since it only has some connotation for local Toronto anachronisms who live in the past, it also slaps in the face and alienates all other Canadian fans. Trying to sell the Huskies as Canada's team would be an abject failure. It is 2013, not 1946 and time for something new and more appropriate.